Calendula has antiseptic, antibacterial and anti-fungicide properties. 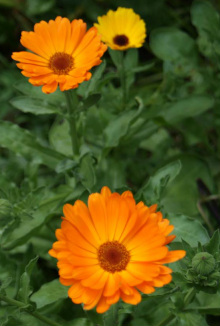 During the Civil War doctors would used the calendula flower to treat open wounds. Modern herbalists use it topically because of its anti-inflammatory properties. Some herbalists contend that it is the single most effective herb for use in the treatment of sunburn. It is also claimed to be effective in treating athlete's foot and as a tea to relieve indigestion and stomach pain associated with ulcers. Chives add an oniony flavor to sauces, salads, oil, vinegar, eggs and potatoes. 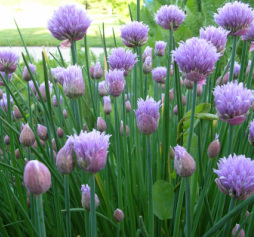 The pink chive flowers can be added to salads for garnish and flavor or used to make pretty flavored vinegar. Chives are usually used fresh because these don’t retain their flavor when they are dried. Hint: Add Chives at the last moment to hot foods, since heat lessens their flavor. Coriander and Cilantro are from the same plant but they are not interchangeable in recipes. Cilantro is the fresh leaf; coriander is the seed. Cilantro is a common ingredient in Mexican dishes and Indian curries. Use cilantro whenever you want a little kick in a stew or soup, add it to salsas and bean dips, mix sprinkle crushed cilantro over stir-fried vegetables or mix it into sour cream and use it as a topping for chili, tacos, or enchiladas. Not everyone appreciates the pungent flavor of cilantro, however, and some people feel very strongly about it. The Facebook group “I Hate Cilantro” has over 3000 members and ihatecilantro.com has almost 4000 members. Many of them claim cilantro stinks like soap or bugs and the name has been said to derive from the Greek, koris, the word for bed bugs which stink when they are squished. 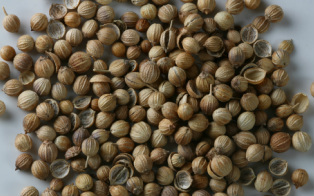 Coriander was cultivated very early. Seeds have been found in Egyptian tombs dating back to 1000 BC and are mentioned in the Old Testament when describing the cakes the Israelites made from manna. Ground coriander is used in a wide variety of dishes from desserts, sweet pastries, breads and ginger cookies to pickles. In South American, Indian, Mediterranean, and African cuisines coriander is a common ingredient in curries, stews, marinades, meat and seafood dishes. Most people think of Sage in connection with stuffing at Thanksgiving or in sausage but it is also used in many other meat, poultry and seafood dishes. It enhances the flavor of eggs, vegetables and cheese dishes as well as breadsticks, cornbread, muffins, and other savory breads. Rub sage, cracked pepper, and garlic into pork tenderloin or chops before cooking. Rubbing a sprig of Summer Savory on a bee or wasp sting is said to give relief. Winter Savory blends well with oregano, thyme and basil and is a good addition to beans, meat, poultry or fish dishes. Dried savory also goes well in stuffing mixed with sage, thyme, and bay and is very good in potato salads. Its small leaves are easily added to herb cheeses or as last-minute additions to sautés. Even though winter savory has a strong flavor when fresh, it does not hold up well to prolonged stewing. Sorrel is cultivated as both and herb and a leafy vegetable throughout the world. 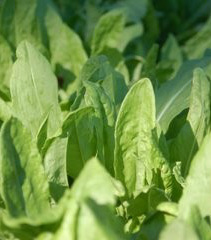 Its spinach-like leaves add a lemony zing to soups, salads and sauces. In some areas it is frequently added to mashed potatoes. In Croatia and Bulgaria sorrel is part of a traditional eel dish and in Jamaica sorrel flowers are boiled, sweetened and added to rum to make a traditional Christmas drink. Sorrel is thought to have gotten its name from the old French surelle which meant “sour”; its sharp taste is due to oxalic acid. The juice of the leaves will curdle milk as well as rennet used in making cheese. Sorrel is also used as a meat tenderizer either the whole leaf wrapped around the piece of meat or pounded and added to a marinade. Stevia is a non-caloric sweetener that has very little effect on blood sugar. Because of this, it has become popular for use in low carbohydrate diets but originally Stevia was only available as a dietary supplement in the United States. It wasn’t until 2008 that it was allowed to be used as a food additive. 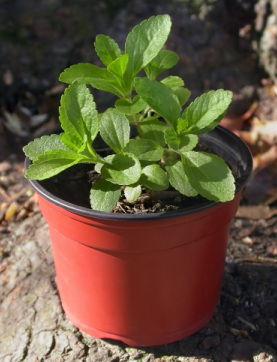 Stevia is 200 to 300 times as sweet as sugar -- two tablespoons of stevia leaf powder will replace a cup of sugar. It’s good to be conservative in measuring at first because too much stevia will leave an unpleasant aftertaste. Stevia leaf may be used in cooking and baking or raw. However, when added to beverages the green leaf powder will not dissolve completely as other sweeteners.